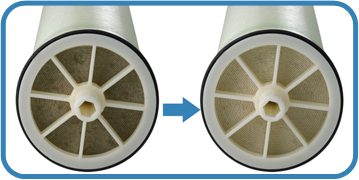 In normal operation, the membrane in reverse osmosis elements can become fouled by suspended solids, microorganisms, and mineral scale. These deposits build up during operation and cause loss in water output or salt rejection, or both. Regular cleaning of the membrane elements minimizes the loss of performance and extends membrane life. Applied Membranes, Inc. has formulated its own proprietary membrane cleaning chemicals. These products are a result of over 30 years of hands-on experience of our engineers and chemists. We offer technical expertise and assistance in troubleshooting and cleaning of RO membranes to give you an optimum system performance. 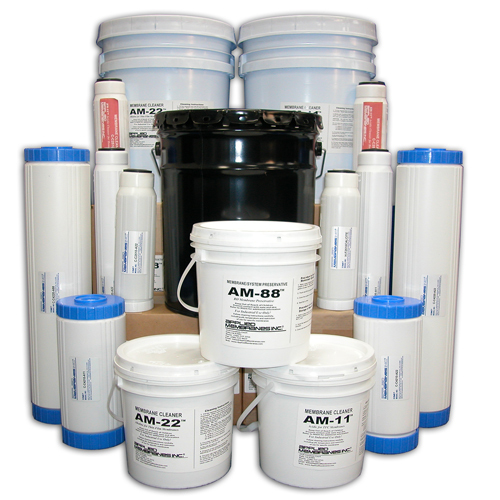 Mixing and cleaning instructions, product specifications, and MSDS sheets are included with each container. * Items marked with an asterisk are classified as DOT hazardous materials and cannot be shipped by UPS or by air. Can be shipped by ground common carrier or ocean shipment only.